Join the Georgia Conservancy on November 10-12 for a weekend adventure on Jekyll Island. Paddling, camping, sea turtles, gators - this weekend will have it all! This is your Georgia, explore it with the Georgia Conservancy. During the next 12 months, we will lead 3,500 people on hiking, paddling, camping and service trips to far-flung natural places, all while celebrating conservation, culture, food, music, diversity and family. We are in the business of conservation, yes, but to succeed, we must also be in the business of love. Love for the rivers, the barrier islands, the marshes, the plains, the canyons and even the urban parks and the cities that surround them. We want folks breaking bread on Georgia’s riverbanks or singing songs around a campfire, from the mountains through the coastal plain and to our amazing saltwater-marsh and barrier islands. Our goal is simple: Create a connection between some of Georgia’s most underutilized, stunning natural places and the people we need to help us protect them. In 2017, we’re leading trips to the Ogeechee, Altamaha, Ocmulgee, Oconee, Flint, Ochlockonee, Chattahoochee, Satilla, Suwannee and Conasauga rivers; to Ossabaw, Sapelo, Cumberland, Blackbeard, Jekyll and Little St. Simons islands; to the Okefenokee Swamp, Cloudland Canyon, Howard’s Waterfall Cave, Panola Mountain, Broxton Rocks, Radium Springs, the Len Foote Hike Inn, Augusta Canal, Ebenezer Creek, Sweetwater Creek, Spring Creek, the mighty Cohutta Wilderness. Our expanded 2017 schedule offers Heartland Rivers of Georgia paddle trips, Service Weekends, Georgia Bucket List Adventure, and Day Trips in every corner of the state. Fear of missing out on a great time? Become a Georgia Conservancy supporter to receive notification of trip releases and Georgia Conservancy updates! Thank you to REI for their leadership and support of the Georgia Conservancy's Stewardship Trips Program! Thank you to the many volunteers and partners who make our trips program possible, especially the Georgia Canoeing Association, SweetWater Brewing Company, Sweet Grass Dairy, Cafe Campesino, Keeping it Wild, American Spirit Works, Whitewater Express, Three Rivers Outdoors, SouthEast Adventure Outfitters, Georgia State Parks, Montane Sparkling Water and the many excellent Riverkeepers across the state of Georgia! The Heartland Rivers of Georgia Paddle Series introduces people to Georgia's Altamaha, Chattahoochee, Flint, Ochlockonee, Ocmulgee, Ogeechee, Satilla, Savannah and Yellow rivers, as well as Spring Creek near Bainbridge, and includes stops in more than 20 Georgia counties, running through or nearby Savannah, Darien, Thomaston, Albany, Thomasville, Hazlehurst, Hawkinsville, Columbus and Augusta. An estimated 2000 people, ranging from expert to novice, will join the paddle series - making it the largest trips program in the Conservancy’s history. Many of the paddle programs are hosted over a full weekend and include the opportunity for camping, hiking and live music. The Georgia Conservancy offers a number of opportunities throughout the year that provide participants with the chance to both explore and give back to some of our state's most precious places. Our 2017 Service Weekend schedule includes trips to Cumberland, Ossabaw and Sapelo islands, as well as the Len Foote Hike Inn. Our Bucket List Adventures introduce explorers to Georgia's greatest natural treasures and offer exciting and educational experiences that one can remember for a lifetime. Our 2017 Bucket List Adventures include trips to the Cohutta Wilderness Area, Conasauga River, Okefenokee National Wildlife Refuge, Blackbeard Island Wilderness Area, Cabretta Beach on Sapelo Island, Jekyll Island State Park, Cumberland Island National Seashore and Cloudland Canyon State Park. Our Day Trips help to supplement and enhance our already robust statewide trips schedule and aims to highlight and acknowledge the diverse array of green spaces, natural resources, individuals and organizations that are putting metro Atlanta on the map for environmental stewardship and sustainable growth. Campfire, great friends, amazing places - nothing embodies the spirit of conservation and exploration better than a campfire shared with friends. Thank you to our friend and artist Kyle Brooks, aka BlackCatTips, aka our Bears Around Georgia co-conspirator, for his inspirational poem that will be read around every campfire on every trip during 2017. 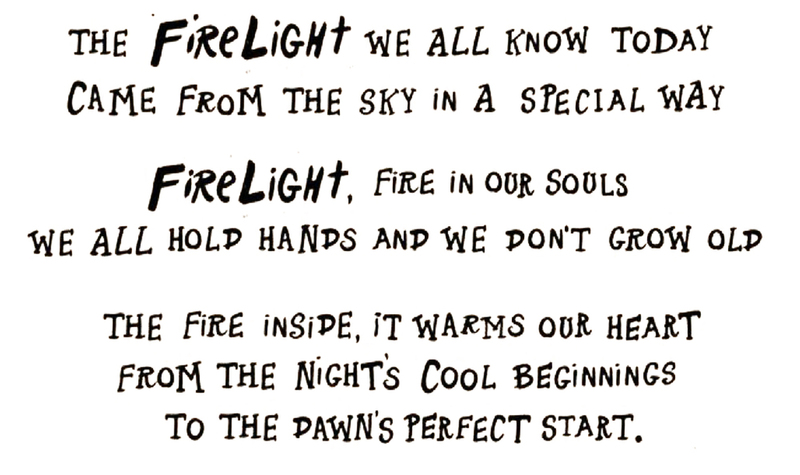 Kyle's poem debuted at Firelight, the Stewardship Trips Program's annual fundraiser that hosted over 1,000 people for an evening of live music, SweetWater beer, good cheer and campfire.